Posted on February 7, 2006 by Chad O. 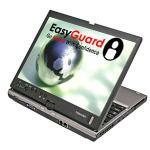 Enhanced, spill resistant keyboard, hock-absorbing materials to help safeguard critical components, The Toshiba Hard Disk Drive Protection System which detects sudden “acceleration” in any direction are all part of EasyGuard technology consisting of four elements: Protect & Fix, Secure, Connect and Optimize. PC Magazine also has a short article about the M400. This entry was posted in Announcements, Tablets, Toshiba. Bookmark the permalink.